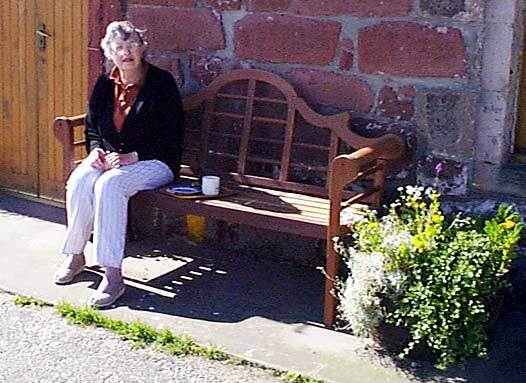 The Cromarty Pottery is based in the cottages behind this building, and for over 30 years Mrs Alison Dunn has made and sold her produce from the shop on the property. The business is now run by her daughter-in-law, Barbel Dister, and the shop is now located down the lane on the right of this house. What a fine figure of a woman Mrs Dunn is! I fondly remember Mrs Dunn and her whole family when I arrived at exactly this place in the summer of 1974, found the tea house "open", enjoyed tea and scones, was shown around the pottery, and then stayed a few days - the Dunns' exemplary hospitality was a foretaste of heaven on earth. God bless them all! Hi Hans. I don't remember you in particular but my whole childhood was coloured by the numerous visiters who came to visit and often stayed for extended periods of time. Is Seabank the house that was occupied by Stella Watson in the fifties? I used to go into the Harbour Office and chat to her when she worked in there. Her husband was I think at sea a lot but I was only a kid then. Mary, That is correct, my Aunt Stella bought Seabank, when she married, from my father Albert Watson, to whom it was left, on the death of their father Capt JohnWatson (Bodders) in 1944. In my Grandfather's time, the lower part of the house room nearest the beach, was let to a Mrs Mackenzie & her sister Mrs Bella Beaton, as a general grocer's shop. Both hailed from Kyle of Lochalsh. For the record both were fluent Gaelic speakers. When it closed as a grocer's shop I can't recall exactly, but early 1950's, as a close guess. The room above the rented shop, was 'the best room', where my grand parents had a collection of many foreign artifacts, gleaned from Bodders' many, many seafaring adventures to Africa and the Far East, in the 1880's to early 1900's. My grandfather was born in Inverness in 1872 at 7 Church street. He was a musician and artist and I remember a pastel picture he did of Seabank House. This must have been drawn in the early 1900'S and shows it ivy covered and very rural looking. I was wondering if it could be the same house, or is there another Seabank House? My Grandad's name was John Douglas Hamilton. The grocers shop was run by my Great Uncle Murdo Mackenzie, and his wife Jessie Mackenzie nee Beaton. Murdo died in 1932 and his wife continued to run the shop after this. They lived at 47 Seabanks, Cromarty. She passed away in 1956. Both Murdo and Jessie were originally from Applecross and spoke Gaelic as their first language.